Posted by admin in Saturday volcano art. Remember Hunga Tonga-Hunga Ha’apei? 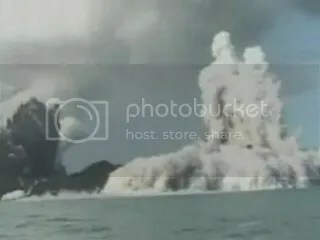 In March of this year an undersea volcanic eruption took place at the islands of Hunga Tonga and Hunga Ha’apei in Tonga, which produced some very dramatic images. Our work of volcano art this week represents a similar event in the same area: ‘Eruption near Tonga’, a hand-coloured lithograph from 1886, in the collections of Auckland Art Gallery, New Zealand. 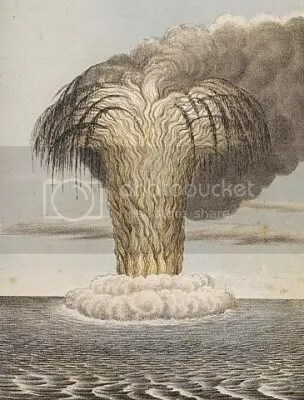 The print is anonymous and it is unknown whether the artist was working from direct experience of the event or from descriptions provided by others, but the resulting image does an excellent job within the limitations of the medium in representing all the main characteristics of the eruption: steam boiling up around the eruption column, the incandescent tree-like column itself, ashfall fountaining out from the top and falling back into the ocean, and the dark eruption plume billowing away from the top of the column. The power of the eruption is conveyed all the more powerfully by the isolation of the event against the flat background of sea and sky. Posted by admin in activity reports, eruptions, Pacific, submarine volcanism, Tonga. Eruptive activity at Hunga Tonga-Hunga Ha’apai appears to have declined somewhat over the last 12 hours, according to the latest advisory from Wellington VAAC (10:29 GMT 19 March 2009). The VAAC advisory, based on pilot observations and satellite imagery, reports ‘no more active eruptions, steaming to 6000ft [1800 metres]’, with ‘white and wispy ash haze extending to large areas ENE blw 5000ft [below 1500 metres]’. An earlier advisory (17:58 GMT 19 March 2009) reported frequent eruptions and ash clouds to FL130 (13000 feet, 4000 metres), with a plume extending 300 miles (480 kilometres) ENE. 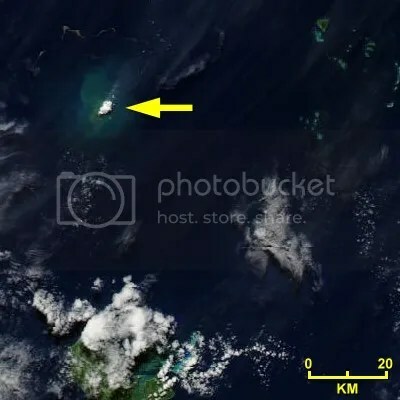 At 01:30 GMT today NASA’s Aqua satellite captured a MODIS image which showed only a small plume extending less than 10 kilometres ENE of the volcano (from the NASA MODIS Rapid Response site: original image is here, detail reproduced above). The BBC has some fresh video of the eruption from the inspection trip made by Tongan geologists yesterday. 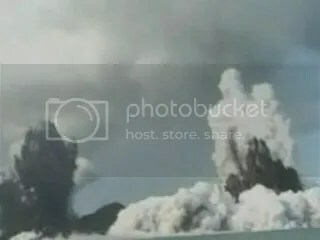 CBS News has the AP report of the eruption, with added video, pictures, and the usual mad/dumb/hilarious comments from the visiting public; they also have a short photo essay on the eruption (titled, in typically odd CBS fashion, ‘Undersea Volcano Erupts Photos’). And the Boston Globe’s ‘Big Picture’ feature lives up to its name with spectacular big, big pictures of the eruption. As if this eruption wasn’t enough of a reminder that Tonga is situated in a geologically highly active part of the planet, there was a magnitude 7.9 earthquake in the Tongan Arc yesterday. There is no reason to suspect a direct link to the eruption. A tsunami alert was issued following the earthquake, but was later cancelled because it was ‘a tiny tsunami … nothing to worry about’. UPDATE: Lousy science reporting from the BBC, who are asserting on the basis of no evidence at all that ‘An earthquake may have triggered an underwater volcano to erupt’. Nice video, clueless commentary: Quake may have caused eruption. Additional update, Dr Klemetti at Eruptions is also irritated by this stuff: ‘absolutely terrible “science” journalism … silly note of dread … all conjecture’. For all our coverage of the Tonga eruption: Tonga « The Volcanism Blog. Posted by admin in eruptions, Pacific, submarine volcanism, Tonga. The eruption is ongoing at Hunga Tonga-Hunga Ha’apai: the latest volcanic ash advisory from Wellington VAAC, issued at 05:23GMT today, reports ash emissions at FL130 (13000 feet or about 4000 metres), expected to rise to FL150 (15000 feet or about 4500 metres) over the next few hours. The Aviation Herald quotes Airways New Zealand reports of ash up to 15km, but VAAC statements give no confirmation of this figure. The Aqua MODIS image of the Hunga Tonga-Hunga Ha’apai eruption that we were able to preview on this blog yesterday (thanks to our friends at NASA) is now available at the NASA Earth Observatory, in the ‘natural hazards’ category: Submarine Eruption in the Tonga Islands (18 March 2009). The image comes with the usual annotations and detailed commentary. 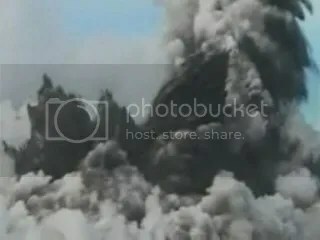 BBC News has a video of the eruption (some stills from the same video can be found at our earlier post) which is a beautiful case study in hydrovolcanic phenomena: voluminous steam clouds, violent explosive activity, dark and rapidly expanding eruptions of volcanic ejecta, debris clouds spreading across the ocean. Spectacular stuff. The video also shows clearly that there are currently two active vents. Associated Press reports Tongan authorities saying that ‘there have been no reports of fish or other animals being affected’. This seems on the face of it unlikely, and is contradicted by other reports. A TVNZ report on the eruption says that ‘Boaties who were close by when the eruption took place talked of burning birds falling from the sky’ and that ‘wildlife from the island closest to the eruption have been completely destroyed’, while ABC Radio Australia quotes a Tongan journalist: ‘There were lots of dead fishes and dead birds’. Tongan government geologists will be making an inspection of the area by boat today. They couldn’t go earlier, as no-one could agree who should pay the Tongan Navy for the fuel the trip would use. 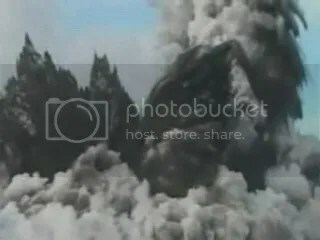 A Japanese reader of The Volcanism Blog has sent in the following images of the Hunga Tonga-Hunga Ha’apai eruption, captured from a video taken on 18 March 2009. These images clearly show that there are two active vents. The white plume consists mainly of steam, the dark masses are dark pyroclastic material projected violently upwards as water enters the magmatic vents, creating powerful phreatic explosions. The ragged-edged effect visible on the dark clouds is caused by larger fragments of ejected material following parabolic curves as they are hurled upwards and outwards, trailing smaller fragments behind them. 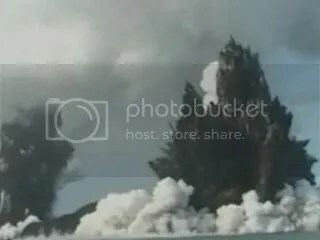 UPDATE: The video from which these images are clearly taken has turned up on the BBC News website: Underwater volcano erupts off Tonga. At the end of the video, around the point from which the final image reproduced above comes, voices can be heard off-camera saying ‘I think we should run away’, and ‘turn the boat around’. The MODIS equipment on NASA’s Aqua satellite captured a true-colour image of the submarine eruption of Hunga Tonga-Hunga Ha’apai in Tonga at 01:45GMT (14:45 local time) on 18 March 2009. The full-size image can be found at the NASA MODIS Rapid Response site. 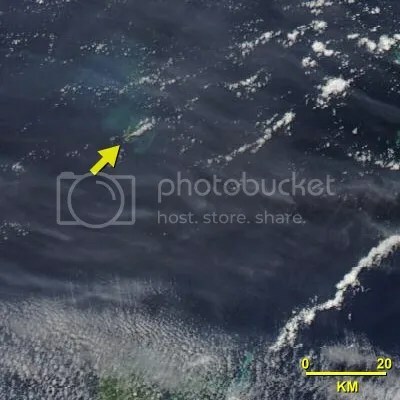 Below is a detail of the image showing the eruption (yellow arrow). North is at the top; the island at the lower edge is Tongatapu Island, where the Tongan capital Nuku’alofa is located, while upper right are the islands of the Nomuka Group. The eruption is producing a dense plume of steam which shows up white against the ocean. Volcanic ash can be seen floating on the ocean surface around the plume. Click here to view the original full-size image (at 250m per pixel scale – other resolutions can be selected) at the NASA MODIS Rapid Response site. There is also now a nice clear mapped version here. UPDATE: This image is now available at the NASA Earth Observatory, in the ‘natural hazards’ category: Submarine Eruption in the Tonga Islands (18 March 2009). Posted by admin in current research, geoscience, natural hazards, Pacific, submarine volcanism. Seven huge coral boulders standing on the western shore of Tonga’s main island Tongatapu may be evidence of a tsunami produced by a volcanic eruption, according to University of Texas researchers. The boulders, which are up to 9 metres high and weigh up to 1600 tonnes, are made of coral similar to that which makes up the offshore reefs of Tongatapu; their coral was formed about 122,000 years ago. They were clearly not formed in their present location and could not, on largely flat Tongatapu, have rolled downhill from somewhere else. The conclusion is that they were torn from the reef and hurled inland by a tsunami generated by a submarine eruption, probably from one of the volcanic centres in the northern section of the nearby Tonga-Kermadec Arc. ‘These could be the largest boulders displaced by a tsunami, worldwide’, says Matthew Hornbach of the University of Texas Institute for Geophysics. ‘We think studying erratic boulders is one way of getting better statistics on mega-tsunamis. 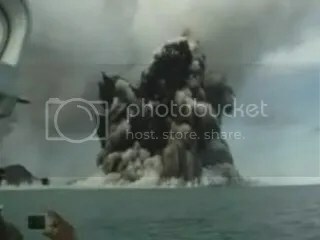 There are a lot of places that have similar underwater volcanoes and people haven’t paid much attention to the threat’. UPDATE: Dr Erik Klemetti at Eruptions takes a cautious look at the Tonga boulders: ‘it will be interesting to see what evidence they have for the deposit being from a volcanically-triggered event’. UPDATE: National Geographic News has published an article on the Tonga boulders, which has been added to the list of links below.